Hey Serge can I borrow your goggles? I'll be needing them to play as I now have a balaclava that some kind soul is lending me! Can you believe we have an INDOORS this year?!?! Like back in the day in the Maison de Velo! Fun times, thanks Andros (and Ben and Eric and the rest that put this together). Anyone forget a Starbuck's coffee mug? Those are my "value village" ski goggles but I would like them back as they get used. I tried using two pairs so one could defrost while the other froze but found this did not work either. I was blind with goggles. I am told I have a basket of yours so we will meet up shortly and do an exchange. Big disc golf in the books Wednesday and Friday night this week as looks like we are getting snow. Let me know if you are free either night. Otherwise, there will be even bigger disc golf plans in the very near future. It is with great sorrow I announce the passing of my trusty XL. When originally molded and stamped in 2006, it had lofty dreams of being a shining light in someone's bag, assisting its owner with tournament win after tournament win. Alas, in August 2006, it ended up in my bag so it had to settle for a sporadic flicker of flame. In its early years, it was the go-to driver. But the years of bouncing off trees and hitting rocks took its toll and it could not fly as far as it once used to. But this beat up disc soon became the go-to disc for long, straight tunnel shots, proving its worth to the other discs in my bag many times. But the years finally caught up with it last Saturday. In the first round of the Ice Bowl, it did its job on hole 8 and made it far enough down the tunnel to present a birdie bid. However, in the second round, on the same hole, is skipped left about half way down the tunnel and hit the third tree head on. The resultant carnage had the disc split almost perfectly in two. A subsequent autopsy revealed an extreme case of discoporosis (the -35 degree temperature could also have played a role). Those who wish to show their last respects can do so. Viewing will be open blue box and available until next blue box recycle day. Its last wish, while lying all broken with paparazzi hovering over it, was in lieu of flowers, donations to help support the Big Brothers/Big Sisters Disc Golf Tournament would be preferred. 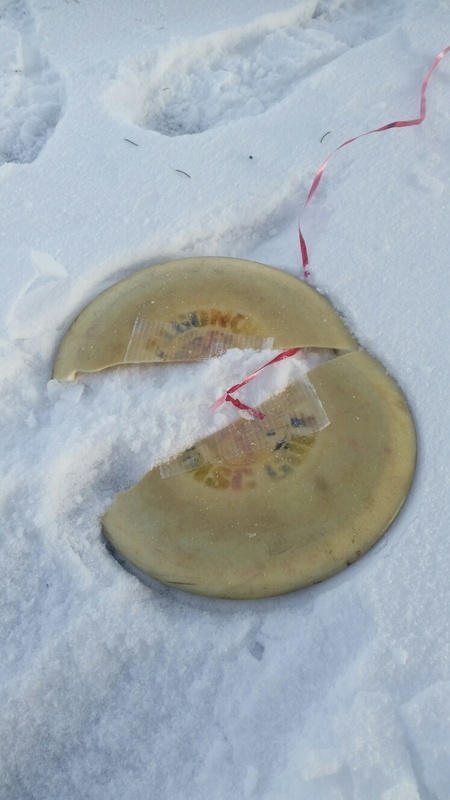 Always sad to see an Algonquin Disc Golf disc bite the dust. Damn, even the duct tape couldn't hold it together. I've played alongside Mike and that disc for ages. What does the flight log read, 100 km ?? This would have been fun to play in, too. While it may be to early in the grieving process, and I know it seems right now that nothing can replace your trusty XL, but this took place during a Daredevil Discs sponsored event and Daredevil Discs would like to fill that hole in your bag. Mike, pick a new disc from the Daredevil arsenal and I'll get it to you. RIPieces XL. May you find your way into a Patagonia fleece. I would have run out of discs.